The TS 16″ f/8 Ritchey-Chrétien Astrograph is a dream telescope for astrophotography. The scope is perfect for observatories. The TS 16″ f/8 Ritchey-Chrétien Truss Tube Astrograph is a true RC telescope and will give you spectacular photo results also with large format camera sensors. The telescope is perfect for observatories and will be carried from mounts in the EQ8 class and bigger. ♦ New! Primary mirror and the M117 connector for the focuser are decoupled from each other. 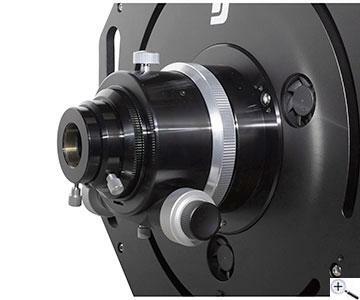 ♦ The focuser can be adjusted (tilted) independently from the primary mirror. Teleskop Service has optimized this 16″ RC especiall for astro photography. The OTA comes with carbon trusses having a thermal expansion of nearly 0. The OTA weight is 37 kg and it has a Losmandy style dovetail rail on both sides. Our 16″ f/8 RC Astrograph illuminates a max. field diameter of approx. 70 mm. Without corrector, 35 mm are possible. In the latter configuration, you have a pure mirror system without any lenses. You don´t need an IR cut filter and can use the full spectrum with a suitable CCD camera. The TS RC has a generous back focus allowing to attach many accessories like off-axis guiders, filterwheels and much more. The distance from the tube backplate to the focus point is 306 mm. To reach the perfect focus position, we suggest the GSRCV1172 und GSRCV1175 extension rings. The position of the rings is between focuser and tube backside. So you always have a good position of the draw tube. The 3″ Monorail focuser is a further development of the crayford design. The load is not carried by four (often underdimensioned) ball bearings, but on a stainless steel track on the base, thus preventing tilting and bending even under high loads. It is countered by a big knurled screw that centers the inner tube exactly to the rail. The load is distributed evely across the rail´s surface. 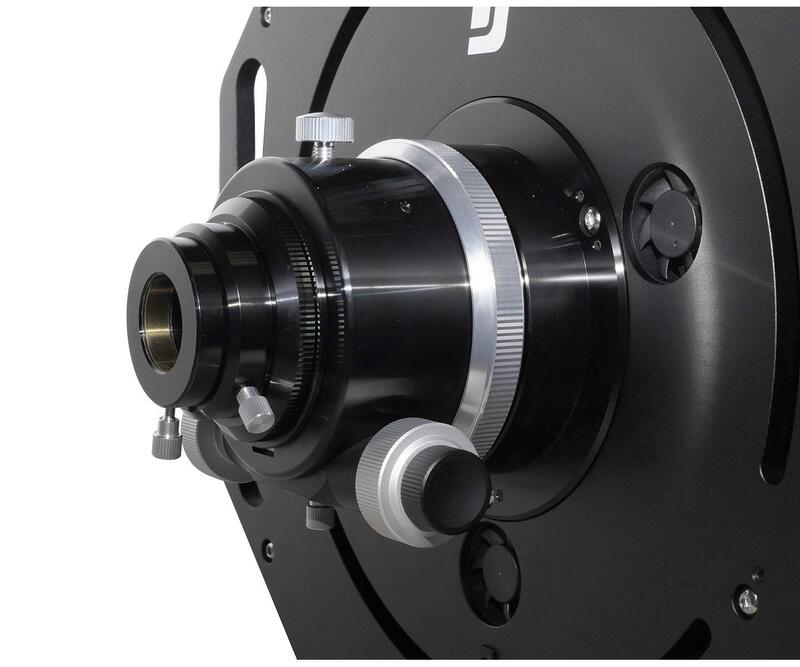 ♦ For very heavy cameras, we offer an upgrade to a heavy focuser from Starlight or to the rack and pinion focuser TSFOCR30S from TS Optics. The RC telescope has three small cooling fans in the rear cell that help create an ambient temperature within your telescope for more stable viewing and less fluctuation in focus. The fans are powered by an external battery pack. This battery holder accepts 8 AA batteries (sold separately). Schmidt-Cassegrain,m EHD, ACF… & Mak-Cassegrain telescopes achieve focus by moving the primary mirror back and forth inside the optical tube assembly, and this movement can cause image shift. While manufacturers have done a pretty good job of minimizing image shift on their telescopes, a moveable mirror makes it almost impossible to eliminate it completely. The Ritchey-Chrétien has a primary that is fixed in place, removing the possibility of image shift and also the job of collimating the primary. Optical Design: True RC with a hyperbolic primary and secondary mirror.